You may be feeling a little unsettled at the moment. This feeling is an important indicator of the need for change. The Flow indicates that you are about to experience a new desire to grow and a drive to push forward. You’ve been letting things slide on some of the important matters for too long. Your horizons will broaden if you let them. You need to open yourself up to the various possibilities in front of you. If you do not act, and act soon, the tide will change and the opportunity may be lost. You will find it helpful to reconnect with the spiritual in your life. You are not expected to do all this alone or without inspiration. The first part of this new mental journey for you will be to simply develop rough plans and sketches of where you want to go. You need to develop yourself. You need to push out. You will be too restless if you remain where you are. The journey or project on which you embark will need a very precise destination. But the plans to get there only need outlining at this stage. One thing you can be sure of is that if it doesn’t ‘click’ and feel right and wholesome – if it doesn’t feel immediately true – then it’s probably not the right way to go. That said, once you realise broadly where you are heading you will more than likely need the help of others. This will mean you actually physically going and talking to them. You need to be able to look them in the eye. This will help communicate your plans and to gauge their level of interest and connection. You will benefit from their ideas, too, because they are likely to be affected by where you are going. You may even need them as part of your team to get there. In some ways it’s almost as though you need their permission. If you don’t get their buy-in at this stage then you will lose precious time and energy later on. Make sure of your resources now. What you need to do at the moment will be obvious, don’t over-complicate things. Do what is necessary and get all the help and cooperation you need. The long and short of it is that you desperately need to broaden your horizons and your thinking. Taking a wider view will help break your feelings of staleness in life. Now is the time to start breaking out of mental ruts. By starting to include others in your plans and laying the groundwork for the future you will generate three benefits. Firstly, others will see that you are serious, and they need to see that before they will help. Secondly, by sounding them out now they will be able to prepare in advance and they, too, will also have time to think. Thirdly, and perhaps most importantly, it will commit you to get moving. When you are starting to build momentum, this will be useful. By doing this you will be able to capitalise on this time for deep thought and serious reflection on exactly where you are going. This is therefore a good time for preparation. Via made an appearance this week: You’ve been spinning your wheels for too long on some of the things dear to you. Now is the time to get things in the proper gear and start to get traction. Come on! Do the work necessary! 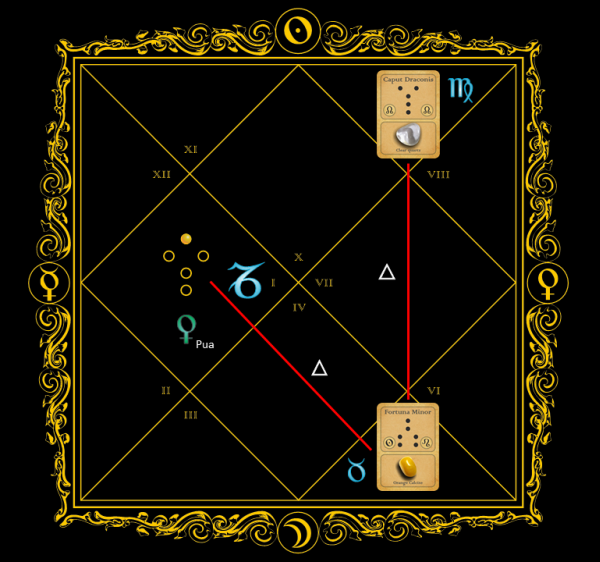 The Flow this week shifts deliciously and intriguingly from external mental considerations of Caput Draconis in the ninth (Virgo) to a very earthy and practical set of physical conditions with a trine to Fortuna Minor in the fifth (Taurus). This is a fairly radical shift from mental to physical: a blossoming out of ideas into solid interactive and grounded relationships with others. The Active Transform Puella (234) in the first house (Capricorn) suggests that we need to maintain this earthy outlook and set our mental sights further outward. There will be much in work to do. It is therefore essential to get the preparation started on the right foot. If you’ve found this casting helpful then please tell your friends – they might benefit as well. Thank you.